Where do I use my P&N Homewares voucher code? Browse online at P&N Homewares and discover a huge array of furniture for your bedroom, living room, office, dining room and kitchen including beds, mattresses, bedside tables, wardrobes, tables, storage options, chairs, sofas, matching dining tables and chairs, armchairs, stools, tv units, bookcases, sideboards and much more. You can also discover a huge array of accessories including different types of rugs in various colours and shapes, as well as mirrors, clocks and headboards. If you’re looking for a range of products that match you can take a look at the collections available and discover Arcadia, Charles, Hollywood, Lisbon, Corona, Ashmore and Eiffel collections, plus many, many more. If you’re after the very latest furniture and accessories then check out the ‘new arrivals’ section where there are loads of new pieces available in various styles, colours and shapes. Or, if you’re shopping on a budget you can take a look at the ‘clearance’ section where there are tons of discounts available on a huge array of furniture for all rooms in your home. In order to help you buy the very best furniture, P&N Homewares provide a handy blog section where you can discover loads of handy articles and posts on all things home and furniture. Discover how to get the look for less, how to furnish and make the most of small living spaces, what to replace your old furniture and home accessories with, great gift ideas for your loved ones, plus much, much more. Browse through huge P&N Homewares archives to discover a huge array of articles dating back months. You can also discover new posts every week with new information and handy tips and tricks on how to make the most out of your homeware. If you’re looking to furnish your bedroom with stylish furniture, that’s also affordable, look no further than P&N Homewares. In the bedroom section at P&N, you can find single, double, king and super king size beds, as well as mattresses to fit all these sizes, plus bunk beds, sofa beds, guest beds and day beds. As well as a huge array of beds and bed accessories at P&N Homewares you can also discover a wide variety of other furniture including bedside tables, hanging rails, dressing tables, wardrobes, chest of drawers and bedroom sets. There’s also an array of accessories available too which includes headboards, mirrors, clocks and ottomans. All of the products available in the bedroom section are incredibly stylish and made with the highest quality, so you know they’re built to last. All of the pieces available are also extremely affordable, allowing you to buy more for less and save money on your order. P&N is passionate about all the products that they showcase which is why they search for rugs that will inspire, delivering high-quality options to you, your floor and your feet. From cutting-edge contemporary styles to more traditional designs, P&N use their experience to ensure they offer a wide range of beautiful, durable rugs that will help you turn your house into a home. Browse through their online selection and discover various styles of rugs including traditional, shaggy, plain, modern, runner, patterned and printed styles. Shop for your rug by type or by size and discover rectangular, circle, oval and half circle rugs in multiple colours such as brown, beige, silver, black, blue, pink, cream, yellow, orange and purple. Find more shipping information here. You have the right to cancel a contract or return an item within 14 days without giving any reason. 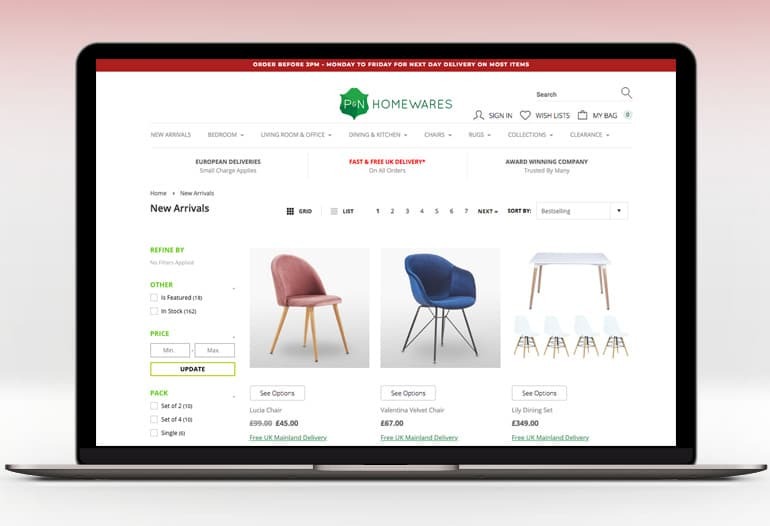 P&N Homewares is one of the largest online retailers of furniture in the UK, selling their products worldwide and providing high-quality pieces at affordable prices. With a wide array of furniture for every room in your house including your bedroom, living room, office, dining room and kitchen, with P&N Homewares, you can find stylish furnishings for your whole home that are both affordable and made to last. Shop online with a P&N Homewares discount code from us and you can save even more on your order too, you can also enjoy great savings in the clearance section too.